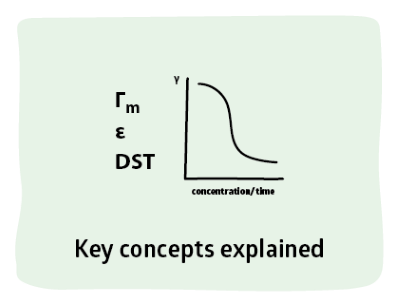 Here is a DST model that is literally about life and death - the ability of your lungs to breath. It is a specialist topic which I happened to find fascinating. The model is particularly potent for systems involving insoluble surfactants where there may be large differences between the absorption and relaxation coefficients. Of course, whatever the model, the basic issues are the same - the different models tend to involve different timescales or different balances of absorption and relaxation. The key for this app is not so much the model itself but the general trends observed as you change the input parameters. CRM was specifically modelled for lung surfactants which show large changes in surface tensions during compression and expansion, over the relatively slow timescales of breathing. However the parameters are likely to be relevant to other biological systems such as the phospholipids in liposomes or the sorts of surfactants/emulsifiers used in food science. A comment on timescales is provided below the app, but first we must describe the model in detail. Clearly the behaviour is going to depend on the frequency and amplitude of the change in A. Here you can alter frequency and amplitude and also choose between the two extremes of a sine wave or a square wave. The default parameters are representative of those in the paper. With the sine wave used in the app the response is relatively dull - another sine wave. In the paper the stimulus curve is somewhere between a sine wave and a square wave and the response is more interesting. Selecting the Square option gives a more extreme view because although the frequency is unchanged, the effective frequency at the jump in the square wave is very high so effects are exaggerated. Returning to the sine wave, lowering the frequency below the absorption/relaxation rates gives a much reduced response. 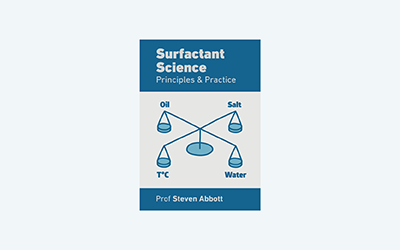 The surfactant can adapt to the change in surface area so the surface tension changes less. Suppose your system has frequencies and k values in the kHz range? The app doesn't allow these. But you simply have to mentally replace "/s" by "/ms" and the results are identical. In other words, the key time-dependent feature depends on relative rather than absolute stimulus and response times. Why does the app always show two cycles of the process? First, it keeps the interface simple - as the frequency changes the only thing that changes in the app is the time-scale on the X-axis. Second, the first cycle is starting from equilibrium whereas the second cycle is starting from the end of a cycle. Often there is little difference, but in some cases it is clear that the first cycle is unrepresentitive of the long-term behaviour, something interesting in its own right. Finally, for those who like me were unaware of the amazing properties of lung surfactants, why is it important for the surface tension to go so low on compression? The answer is complex, but one element of it is that the effort needed to open up the lungs after compression depends directly on the surface tension – so a low surface tension means that it is easy to start expanding the lungs and bringing in fresh air. Another element is that it helps the lungs expand more evenly – those that are still compressed are easier to open than those (by chance) that are more open.